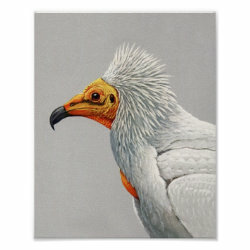 This fine reproduced work by American ornithologist Louis Agassiz Fuertes is a intimate portrait of an Egyptian Vulture. The handsome bird's feathers are shown in fine detail against a plain grey background. This lovely bird art makes a great gift idea for any bird lover.